How this car can be thrown around, how it can so savagely accelerate and how it doesn’t wallow and flop through corners still doesn’t make sense to me. Oh, sure, I know exactly what Porsche’s engineers have done to ensure its two tonne, five metre-long luxury saloon doesn’t feel like a two tonne, five metre-long luxury saloon (it’s actually a five-door hatch technically, but you get what I mean). I know all about three-chamber air suspension and the electromechanical active anti-roll bar. 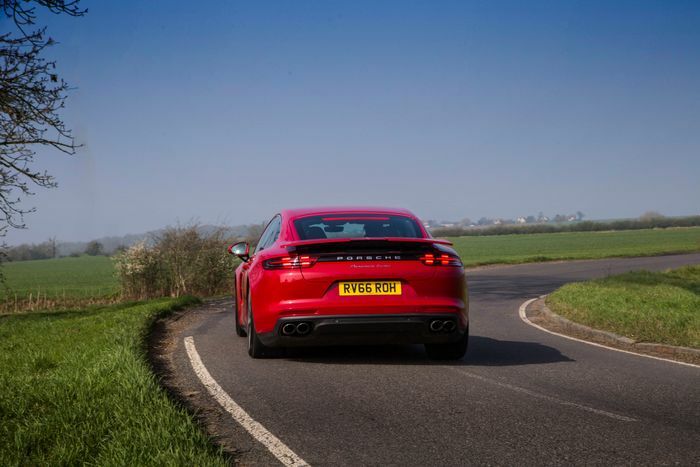 I’m aware of the rear axle steering system, which makes the Panamera’s - now even longer - wheelbase seem much shorter. And I know that launch control and all-wheel drive is a killer combo for spectacular 0-62mph times. 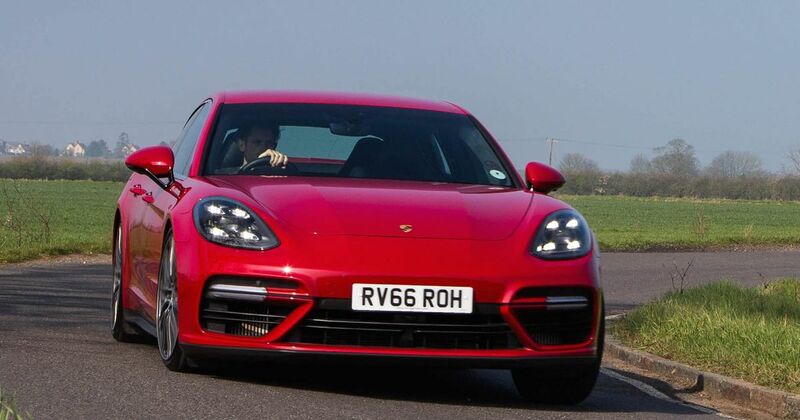 In the case of the Panamera Turbo by the way, that’s 3.6 seconds. But none of that knowledge stops your brain asking the car “how are you doing this?” as the speedo climbs at a terrifying rate, or “how is this possible?” as you take another corner at a speed that should turn a car of this size and weight into a floppy, unwieldy mess. 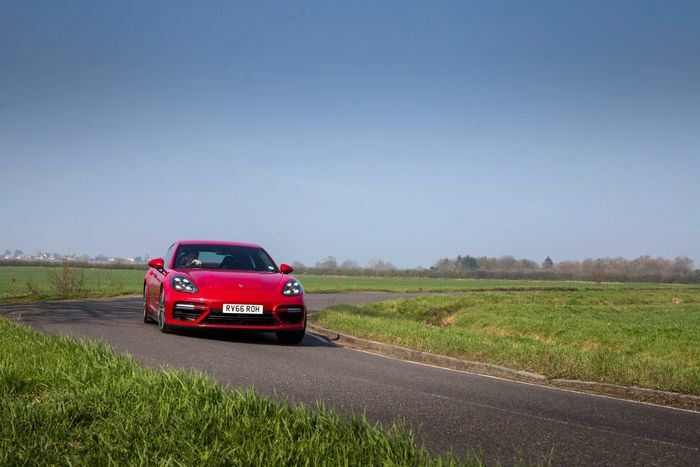 I’m not going to tell you the Panamera Turbo’s just like a 911 Carrera 4 to drive, because it isn’t. Porsche’s chassis boffins obviously can’t defy the laws of physics, even though it feels like they have. There are times when this hulk from Stuttgart still feels like a big, heavy land yacht, but crucially, it doesn’t feel as big and heavy as it actually is. It changes direction in a brutally fast manner, grips like a stubborn toddler holding onto something he or she isn’t supposed to have, and - on the road at least - very occasionally gives a little slip at the rear. It stops as savagely as it sets off, too, thanks to 420mm discs at the front with fat ten-piston callipers. Given the weight though, you may want to think about optioning the fade-resistant carbon ceramic stoppers found on our test car, even if they are a rather painful £6449 on the options list. Go for the standard steel items, and you drop 10mm in disc diameter and drop to six pistons. 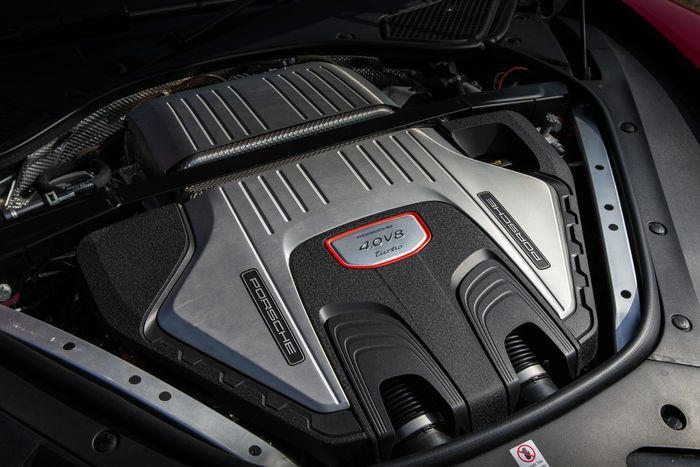 The 4.0-litre twin-turbo V8 has its turbos nestled in between the cylinder banks to give a neat ‘hot V’ package. It serves up 542bhp and 568lb ft of twist, and is flipping potent (it’ll also power the next Audi RS6, rather than the current RS6 as we previously stated). What it does is give you the impression Trump has been left alone with the nuclear football every time you step on the throttle. You get a hint of what’s to come at around 3000rpm, before the full shockwave hits at 3500rpm, pinning you to the back of the fabulously comfortable leather driver’s seat and compacting your organs. We’ve become used to big engines like this coming fitted with the de rigueur ZF eight-speed torque converter automatic gearbox, but since this is a Porsche, it gets an eight-speed Doppelkupplungsgetriebe (that’s ‘dual-clutch gearbox’ if you don’t speak German) transmission. It’s just a little more fierce and immediate with its shifts, and a little more on the ball when you leave it up to your own devices. During anything other than full-bore acceleration it is keen to short shift, so I found myself taking control using the delectable aluminium paddles quite frequently, just to relish a little more in the V8’s guttural bark before the needle smashes into the 6600rpm red line. Pointless, given that that peak power is at 6000rpm, but damn good fun. All that performance is wrapped up in a package which is - at last - easy on the eye. It’s still not something I’d describe as pretty, but the proportions are now ‘correct’. It looks like a stretched 911, and not like a stretched 911 that’s been on the receiving end of a botched plastic surgery session. We simply must give bonus points to the three-piece folding rear-wing, too: it pops out at 56mph to reduce lift, changing angle at 127mph to provide proper downforce. 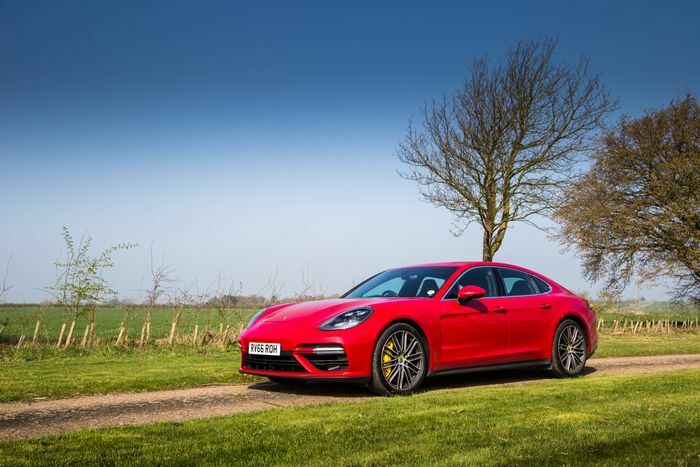 The real genius of the Panamera comes when you calm down and switch from Sport Plus back to Comfort, as this car has fabulous waft potential. It rides well, has every gadget imaginable, is fitted with ludicrously comfortable seats, and has an interior that’s subtly pleasant and nicely screwed together. A massive - and utterly gorgeous - 12-inch touch screen dominates the centre console, with further screens flanking a physical rev counter (thankfully Porsche hasn’t gone full digital with the instrument console). Rear seat passengers aren’t left out either, with an extra LCD display back there too for the climate control. The motorised vents are also pretty awesome. 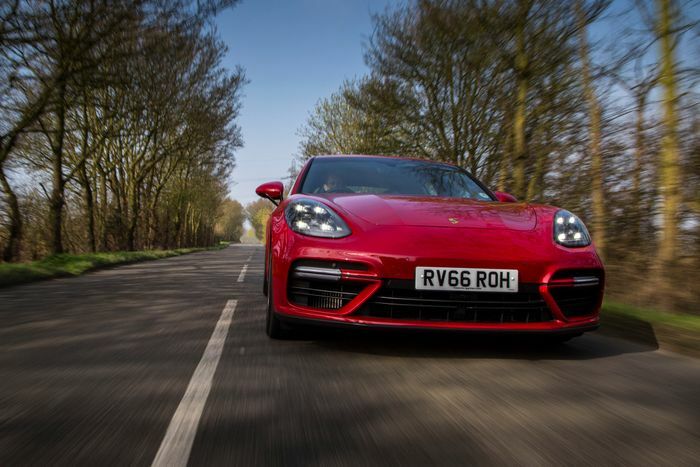 That 12-inch display holds some of the Panamera’s weaknesses as well as its strengths, however. It may be beautiful, but it’s also fantastically complicated - buy one of these, and the owner’s manual will become your go-to choice of toilet reading material for at least a month. 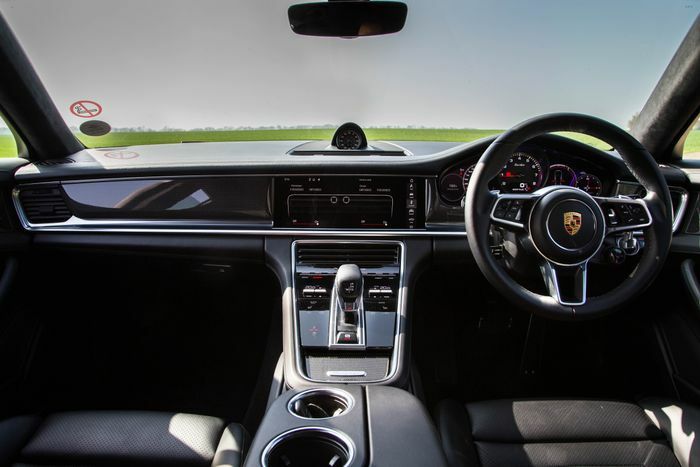 It’s also just not as easy to use on the move as something like BMW I-Drive with its tactile controller - I’m yet to be convinced that touch screens are the best option for infotainment systems, and the Panamera hasn’t changed that stance. Anything else to grumble about? Well, the steering’s not exactly laden with feedback, but that’s pretty standard these days. The car as a whole does also feel quite needless and excessive, but I’m not sure that matters. Yes, you should buy either the diesel or the V6-powered S, but where’s the fun in that? The best things in life are needless and excessive. £113,075 and up (our test car was optioned to £136,853) is a particularly staggering amount of money when the Mercedes-AMG E63 S - which is faster - can be had for around £25,000 less, but the Panamera Turbo feels worthy of that figure. It’s a triumph.